You know, history, when you break it down it means "his story," which is really the story of the dominant culture. And we all know historically that the -- I guess the conquerors are the ones that write the history, you know, and it's really never based on the people that were supposedly conquered. The last chapter in any successful genocide is the one in which the oppressor can remove their hands and say, "My god, what are these people doing to themselves, they are killing each other, they are killing themselves!" When I first got to Pine Ridge, I didn't really get it. All my first assignments were about poverty and violence and gangs and all those stories skimmed the surface. And now, six years later, now that I know the real story, I realize that mainstream American magazines won't print it. The real story is the history -- a history of broken treaties, of prisoner of war camps, and massacres. It's too hard to look at. It's too dark. It's too layered and too painful to fit in between shampoo ads and car commercials. This project has reached the limits of print media. I don't want you to give me money today for a book or a gallery show, where everybody drinks wine and looks at beautiful pictures of suffering. 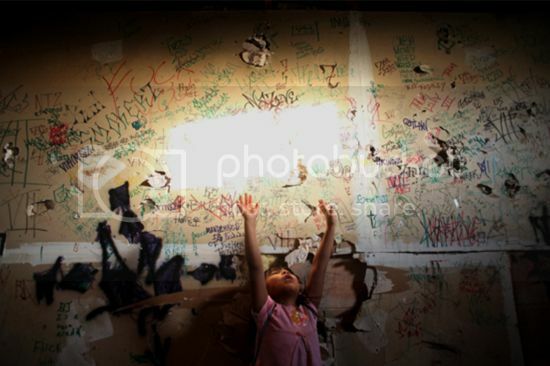 I want to take the images I've made over the past six years on Pine Ridge and put them on billboards. I want to put them in subways. I want to put them on the sides of busses. I want to put them in places where people can't ignore them. I'm here today asking for your participation in a project that will illuminate a hidden history and empower a community. This is a grassroots information campaign. Your involvement, not just your money, is crucial. We will need help distributing these images in your communities. Several partners have already joined me in this cause, including Ernesto Yerena, an activist and artist from Los Angeles who created visuals for the Alto Arizona campaign. Ernesto is collaborating with me to create a poster series based on my photographs that transcends these depressing statistics. This collaborative image is the first of many that we will make in February. Also joining us will be Shephard Fairey, the most prolific street artist working in America, widely known for his ongoing Obey propaganda and Obama's Hope campaign. If anybody can raise an issue to icon status, it's him. My collaborations with Ernesto and Shephard will go up on walls in cities all across America. We will be working hand in hand with Lakota and other indigenous rights organizations to produce this work, sharing resources through a website I have created at honorthetreaties.org. Remember, this project is not a charity. It's about turning awareness into action. In 1890 the Supreme Court ruled upon the longest running court case in US History, the Sioux Nation vs. the United States. The court determined that the terms of the 1868 Fort Laramie Treaty had been violated when the Sioux were resettled onto P.O.W. camps, and 7 million acres of their land were opened up to prospectors and homesteaders. These camps are now called “reservations”. The grim statistics on Native Reservations today are the equivalent to that of a 3rd world country, revealing the legacy of colonization and treaty violations. Unemployment on the Reservation fluctuates between 80-90%. Many are homeless, and those with homes are packed into rotting buildings with up to 5 families. More than 90% of the population lives below the federal poverty line. The life expectancy for men is 47 years old - roughly the same as Afghanistan and Somalia. ACTION: For as little as $10 you can help launch this project. 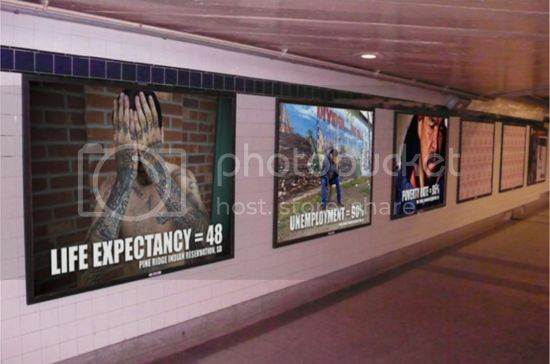 Your involvement will help raise the visibility of these images by taking them straight to the public—to the sides of busses, subway tunnels, and billboards. I want people to think about prisoner of war camps in America on their commute to work. I want the message to be so loud that it cannot be ignored. CREATIVE PARTNERS: Helping me to turn my photos into powerful illustrations are Ernesto Yerena, an artist and activist who created visuals for the Alto Arizona campaign, and Shepard Fairey, the most prolific street artist in America, known for his street art (OBEY) and the Obama HOPE campaign image. These collaborations with Ernesto and Shepard will go up on buildings and bus stops all over the country. I hope to also involve some of you with distribution of imagery and possibly even in the role of “wheat pasting” in your towns. Shepard’s image will be uploaded in April. FINANCIAL GOALS + BUDGET: $17,250 will provide funding for a nationwide guerilla poster campaign. 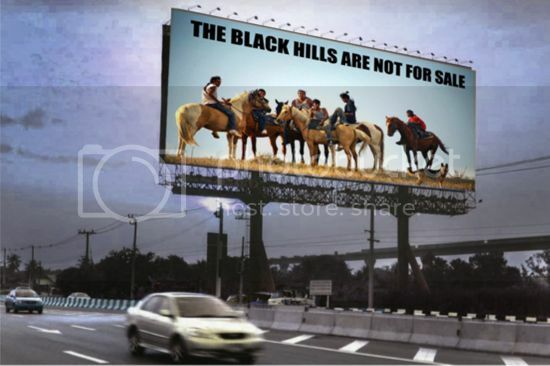 $30k, will allow for substantially more visibility, taking the photo essay to subway platforms in NYC and to billboards around South Dakota and Washington DC, where policy makers have the power to make real change on Reservations. Expenses: 35-40% to printing posters and billboards, 40-50% for ad space, 5-10% Shipping and Travel, and 1% for website setup. 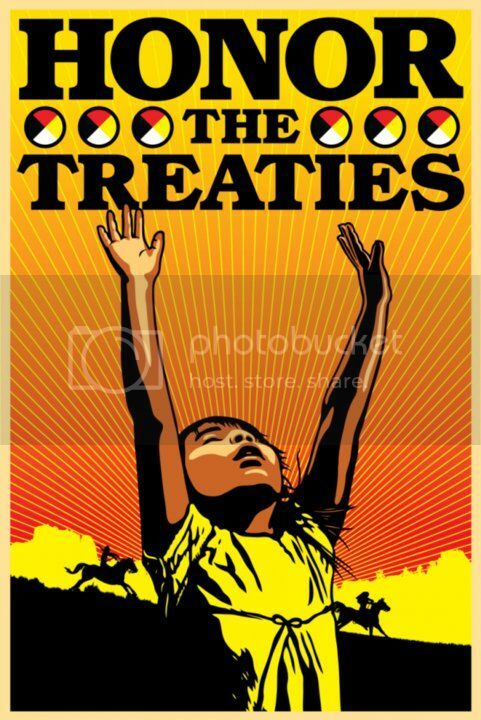 OUTLETS FOR ACTION: Through this campaign a website is forming at honorthetreaties.org I hope to build this site up to become a point of reference for those who want to know more about the history and the (broken) treaties of the Sioux and other tribes. There will be direct links to assist grassroots Native non-profits in places like Pine Ridge. Our first partner is Owe Aku. PLEASE TAKE A FEW MINUTES to watch my TED talk on this subject, the video is posted below. Raising the NATIONAL awareness in metropolitan areas like New York City and Washington DC will help us influence policy makers to help our American Indian tribes and reservations. This is an excellent campaign. 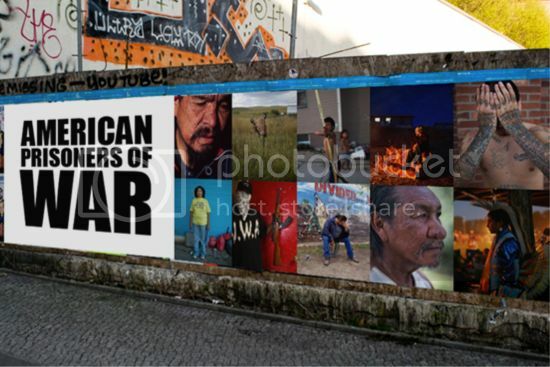 An ongoing series sponsored by the Native American Netroots team focusing on the current issues faced by American Indian Tribes and current solutions to those issues.